A few days ago, in a warm, dry spell between late winter storms, we had some beautiful clouds. Throughout the day, I kept my eye on them. They were cumulus clouds, torn ragged by the wind aloft. By afternoon, they had become backlit by the sun and glowed with a heavenly incandescence. Their beauty called me to paint them, but I knew I'd never capture their shapes precisely in the slow medium of paint. So, I dragged out my sketchbook and a 6B pencil, set up a chair in a warm, sunny spot, and got to work. A bit of smudging with the fingertip to darken the interiors plus a very light line to indicate the luminous nimbus encircling each cloud gave me great satisfaction. Pencil is fast enough that I could sketch the shapes accurately. 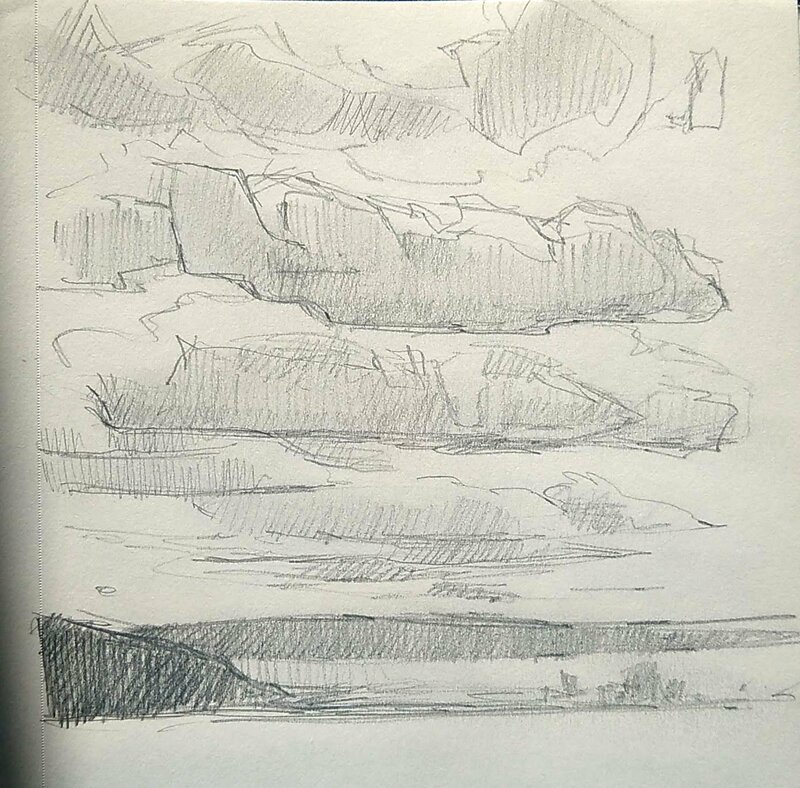 I decided there was nothing more relaxing than sketching clouds while sitting on a sunny porch. 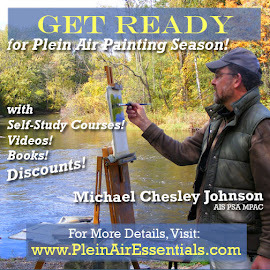 My students, however, often express anxiety when it comes to painting clouds. To my mind, clouds are the easiest of Nature's shapes to paint. 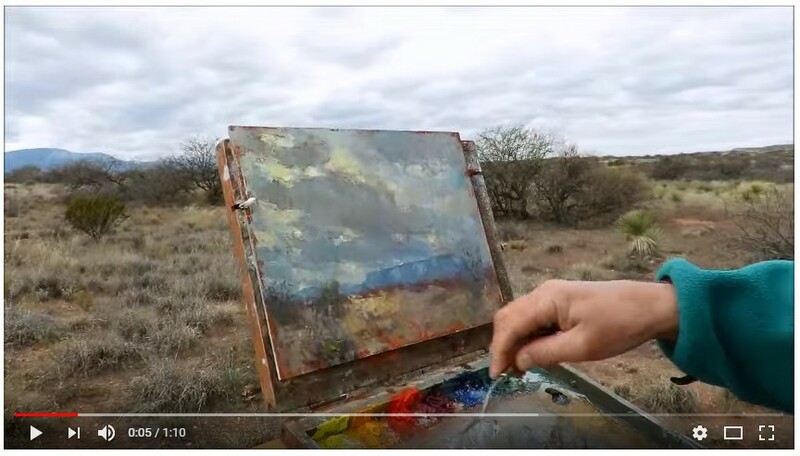 Clouds do change quickly, but with careful watching and a little memory work, you can paint the "feeling" of those particular clouds. You can have the "truth" of the cloud without depicting a specific cloud. 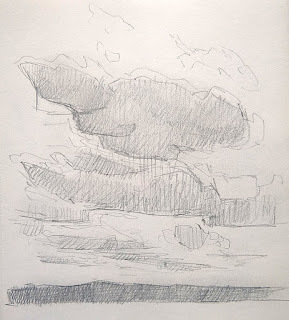 One trick in the field is to observe and sketch a variety of cloud shapes in your sketchbook before painting, and then transfer the most interesting shapes to your canvas lightly with pencil. Cumulus clouds overhead at midday have warm, shadowed bottoms and cool, sunlit tops. 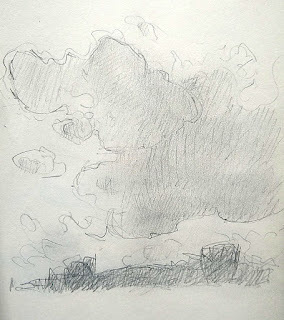 But those same clouds, as they go farther into the distance, will develop cool, shadowed bottoms and warm, sunlit tops—a reversal of what you see when they are closer and more overhead. Cumulus clouds often have a flat bottom that is rather like a dinner plate. This will help with painting these clouds in proper perspective. Imagine a sky full of dinner plates (or flying saucers, if you prefer.) With the overhead plates, you will see more bottom than top; with ones farther off, you'll see more top than bottom. Different kinds of clouds—stratus, cirrus and so on—act differently. 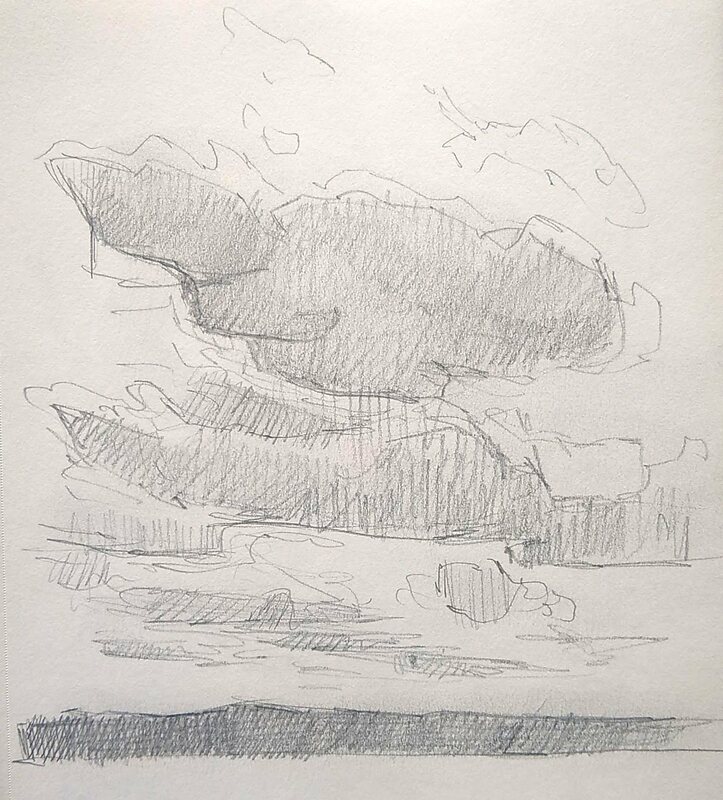 A good exercise for painters is just to observe the properties of different kinds of clouds with a pencil. Look for rhythmic lines, not just in individual clouds, but in the patterns clouds make. 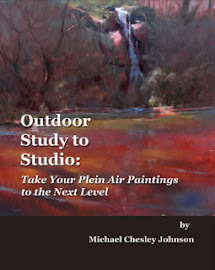 These lines will add energy to your painting. I thought it might be helpful to show some small, color studies of clouds by other painters. 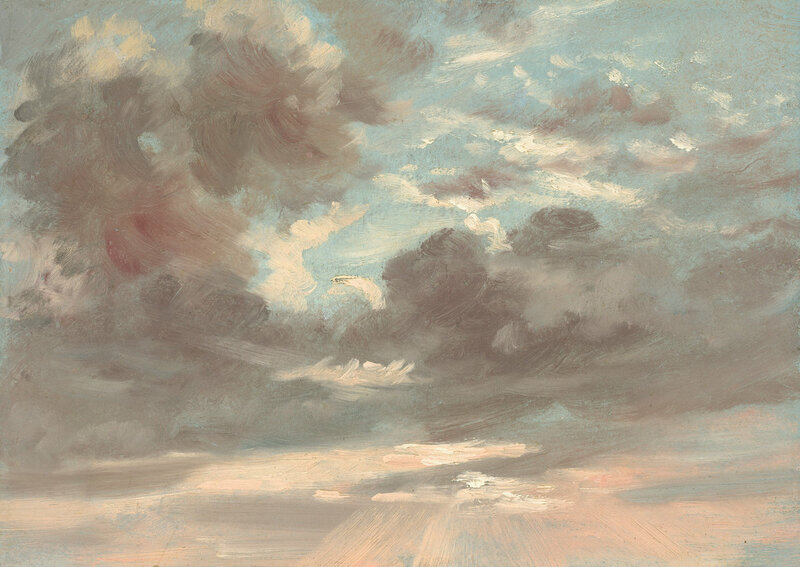 Cloud Study: Stormy Sunset (1821-1822) by John Constable (1776 – 1837.) Oil on paper on canvas, 8 x 10 3/4 in. National Gallery of Art. Landscape Study with Clouds (1829-1831) by Émile Loubon (1809–1863.) Oil on cardboard, 5 7/8 x 9 1/16 in. Metropolitan Museum of Art. 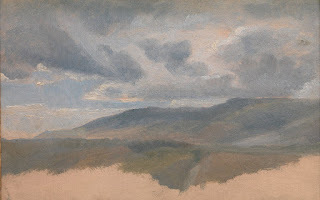 Clouds (ca. 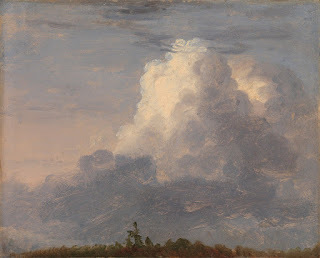 1838) by Thomas Cole (1801–1848.) Oil on paper laid down on canvas, 8 3/4 × 10 7/8 in. Metropolitan Museum of Art.